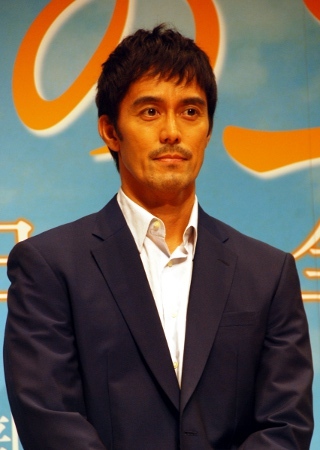 Abe Hiroshi attends advanced screening for "Tengoku kara no Yell"
On July 6th, actor Abe Hiroshi made an appearance at an advanced screening for the film �Tengoku Kara no Yell� at Tokyo's Yurakucho Asahi Hall. The movie is based on a true story about a man named Nakasone Hikaru (played by Abe Hiroshi), who hosted a free music studio below his bento shop for high school students who wanted to play music.�Nakasone�s act of kindness allowed many high school students to make their debuts as professional artists until he collapsed due to kidney cancer and passed away in November 2009. While he was still alive, NHK broadcasted a documentary film and even put it all together to create a book titled, �Bokura no Uta wa Bentou-ya de Umareta: YELL�. When asked to share his thoughts on the movie, Abe stated, �Mr. Nakasone is a man who lived his life at its fullest. So, there� was a lot of pressure to tell the story of his life in just two hours.� He then added, �This work will depict the encounters, the growth, and the strength of people." Actress Mimura will play Nakasone�s wife and Sakuraba Nanami will play a high school student who's aspiring to become a professional musician. Mimura commented, �This is the first time I co-starred with Abe, and I really felt that he has quite a presence through the screen. I felt that the way I was absorbed in perfecting my role was no match for his presence, so I decided on how to act this character out after seeing Abe-san as Nakasone." "Since Nakasone was a man of energetic nature, so I believed that his wife was the type of person who would try to support him in any way possible. Through my imagination, I thought of a character who would hold off on their kindness and tolerance to become a person who'd show their persuasive power by fighting head-on. I thought that if she hid her existence to the side, she would lose and that was unacceptable." Aside from Abe, Mimura, and Sakuraba, other cast members include Yano Masato, Morisaki Win, and Nomura Shuhei. The film will be directed by Kumazawa Chikato, while the theme songs will be provided by Stereopony. �Tengoku Kara no Yell� will hit theaters on October 1st. "Meiji Kaika Ango Torimonocho" to get anime adaptation as "UN-GO"